Many of you will remember Manuel Göttsching by his Masterpiece ‘E2-E4 and know the fact it got sampled by far more than once. Think ‘Sueno Latino‘ to start with… and the plethora of further re-recordings by Derrick May, Joe Claussell, and a bootleg by Carl Craig that prove how ‘Now‘ and Iconic Manuel´s Work is. 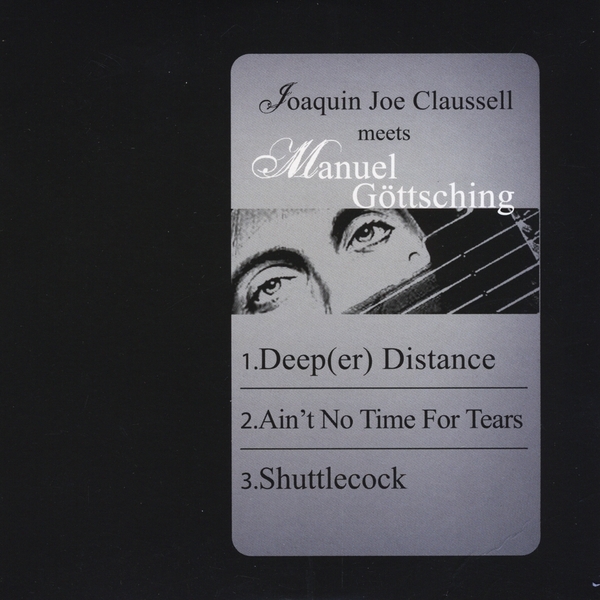 The 2006 edition ‘Joaquin Joe Claussell meets Manuel Göttsching‘ is the first attempt to bring these once illegal mixes finally to a broader and wider audience. It comes with 2 very rare and first time officially released tribute mixes of 1970´s Göttsching Classics, carefully remodeled by Joe Claussell (21.12 minute ‘Deeper Distance‘ plus 10.17 Minute ‘Ain´t No Time For Tears“). The last words, however, are left to MG himself, with ‘Shuttlecock“, a final eighteen minute excursion, which has Manuel improvise over a soft carpet of delayed bell sounds, before the guitar fades away and the track deepens and thickens, like a dark river sweeping along ever more motives and harmonies. Consisting of 3 concert recordings which were originally released on the 6th CD Album Private Tapes : Tracks 1 and 3 were recorded at Bataclan in Paris, 12/1976, Track 2 in Berlin 8/1979.